Remember that funny children’s book where you looked for the wacky, red-striped guy in the midst of fun situations? 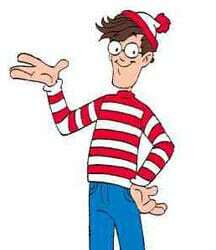 Waldo is what my team at the MACPA often calls me when I spend a lot of time outside our offices. So where is Waldo going next? I recently got a question from a young CPA who asked me why I spent so much time outside the office and how that benefits our members. I think this is true, and our board of directors encourages us to travel the edges of our profession to connect us to the people and ideas shaping our world. They also have charged us with bringing back and sharing our insights with all of you, which we try to do in our town hall / professional issues updates (free CPE! ), on our website, in our publications, and on all of our social channels like Facebook, LinkedIn, Google+, Twitter, and our content sharing sites like YouTube and Slideshare. My travels often include my trusty sidekick, Bill Sheridan, our chief communications officer (www.twitter.com/billsheridan), and other members of our MACPA team, ready to bring back and share the critical insights and information we gain on the road. Most recently we just came back from the AICPA’s Practitioners’ Symposium and Tech+ Conference in Las Vegas, and you can see our insights with Bill’s latest posts here, here, here, and here. MACPA’s Generational Symposium on June 25, from 8 a.m. to noon at Turf Valley in Ellicott City. Winning is Everything: Live talk radio (virtual), June 25, 1 p.m. EST interview with Lisa Benson. AICPA Facebook chat on social media ROA, June 25, 3-4 p.m., with AICPA’s Stacie Saunders. Register here. Then I will be doing professional issues updates for a firm and Marriott’s global finance team on June 26 and 27. MACPA’s Beach Retreat on July 2-5. I will be leading a session titled Living on the Edge: Finding a Competitive Advantage in Turbulent Times. Sage’s Summit on July 22-24 at the Gaylord National Resort in Oxon Hill, Md. MACPA Members got 70 percent off! ASAE’s Annual Meeting in Atlanta on Aug. 4-6, 2013. AICPA EDGE Conference for Young Professionals in Austin on Aug 7-9, 2013. PKF’s Annual HR Conference in San Antonio on Aug. 21-23, where I am leading a session on strengths-based succession planning. I hope to see you in my travels, and make sure you follow me, Bill and MACPA on Twitter!